Growing up as a child was not very easy for me. I had a very different upbringing from my peers and had a lot of self-esteem issues. Honestly, a lot of my days were very sad. I had this sheet I slept with every single night since I was very little (maybe 4 or 5). There was nothing glamorous about it. 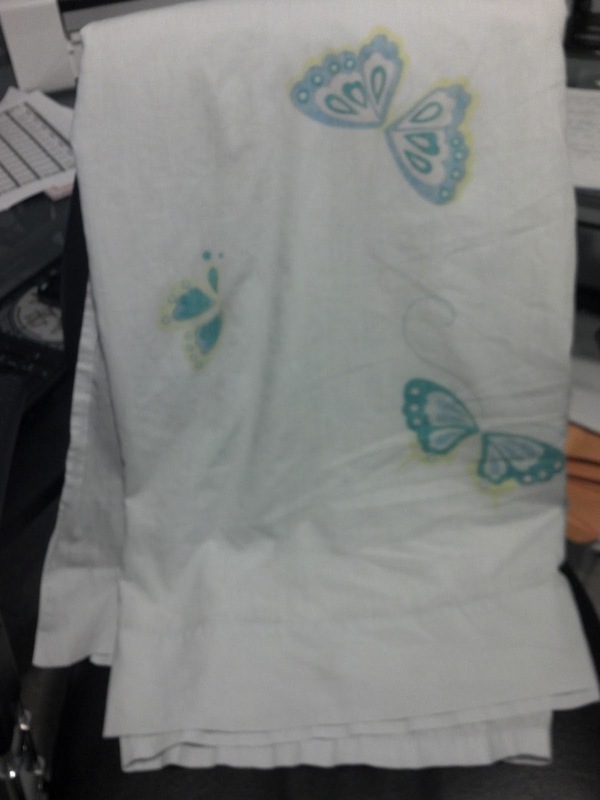 It was just a simple light blue bed sheet with butterflies on it. There was something so special about this sheet though. Over the years it had become so worn that you can practically see through it. It feels like silk and has not one single hole in it. I left my parent's home when I was just 17 years old. I was not allowed to take anything with me but I did manage to grab my "blue sheet". I went through so much over the years but always had my sheet to comfort me. I still have this special sheet after all these years and have even put it in my will for Briahnna to have when I pass away. She has always had a thing for butterflies and it seemed fitting for her to have it. I no longer sleep with my sheet but I do keep it around the house to remind me how much I have grown as a person. Do you have a special keepsake that you won't let go of? What a vivid image of you and the sheet. I had a panda bear that I got when I was in first grade. I used to chew at the nose while I slept. I finally chewed it off. Still have it and gave it to my ten year old. He loves it now. I have this stuffed dog my grandma got me when I was about 6. It is not cute, it has a patchwork design on the body. I don't know why I cannot get rid of it. I have had TONS of stuffies over the years and have thrown many away. I just cannot part with the dog. That is such a dear story. I'm so glad you had this comfort that has helped you as you grow. I know your daughter will take the best care of it when it's time. What a sweet and touching story Shelly! I am feeling all teary reading this! I don't have any keepsakes but, your story really inspired me to NEVER give up and keep looking up! Thank You for sharing. I can easily tell how much the keepsake means to you just by the fact that you still own and look forward to passing on to your daughter. I have a Footprints ring that my then-8 year old daughter picked out for my birthday in '05. it means so much to me. I've never taken it off my finger. That is really sweet that you've kept the sheet, and in such good condition, after all these years. It always feels good to have that one, special "something" that is all yours, that comforts us when we need it most. For me it was this brown teddy bear that I had for years and years and years. It's somewhere packed away in storage now, but that's one tattered little stuffed animal that i wont ever be throwing away.